A collection of heart felt poems and stories from the life and dreams of the author. 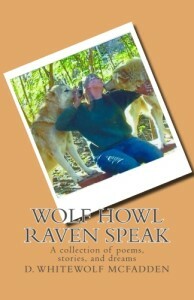 WhiteWolf is a wolf activist, dog trainer, and educator. Throughout her life she has embodied the Spirit of the Wolf, the Voice of the Raven, and the Courage of The Lone Ranger. Remaining an inspiration to all who know her, she teaches dog training, offers workshops, and follows her lifelong interests in animals, the environment, and a creative life. WhiteWolf lives in northern Arizona with Sirius, her retired racing greyhound.